Have you ever asked yourself how secure your home truly is? Windows and doors are the most accessible entry points for would-be burglars, and seeing as your garage door is the largest moving part of your homes, it can often be quite vulnerable. There are some things you can do to make sure you're properly protected. 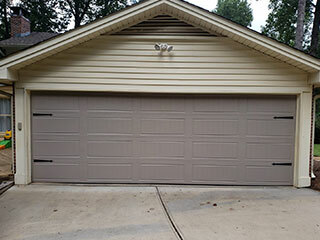 You got anew garage door with state-of-the-art security features, so you're 100% safe, right? WRONG! All the security in the world won't be enough if you don't teach your family to follow proper safety guidelines. You may have an opener that uses rolling code technology which changes the remote's access codes each time you use it, but all of that would become pointless if you leave your remote lying around, ready to be snatched and used by a thief. Also, leaving your garage door open for extended periods of time gives thieves the opportunity to see what you store inside your garage, i.e. what do you have that's worth stealing. Good precautionary measures aren't just about avoiding break-ins. It's also important to teach your family safety procedures in and around the door. This is especially important while the door is in motion. Make sure your kids know the potential dangers and understand why they need to avoid playing with it and its remote. Older garage door opener models were great in their heyday, but it didn't take long for the criminal element to work out a way to gain entry to homes using these doors. Today's modern models are built to thwart a burglar's efforts at every turn. If they can't gain quick access into your home, they're more than likely to give up and try and find a softer target, rather than risk getting caught in the act. If you have an old opener think of upgrading to a new one that has improved security features to offer you, like motion sensor lights and the ability to connect to your alarm system. If your garage door has seen better days you may want to consider investing in a newer stronger model. An old, run down looking door is like an open invitation to thieves, as these older models offer little to no security. Newer steel doors are often reinforced so they are stronger and more durable than their old counterparts. Let our team at Garage Door Repair East Northport help you find a model that's a perfect fit for your security requirements.